The summer months are always a rollercoaster, hopping from one Island to the other for all the competitions in the Canarian Islands. I already made quite a lot of windsurf trips BEFORE the Canarian Islands (South Africa, Morocco, Bonaire, Maui, Turkey and Portugal) although my intention was to travel less this year ;-), but O.K, back to the Canaries. The trip started in Pozo, Gran Canaria. Here was the 2nd stop of the PWA Wave Tour of 2018 held, and this year was a special year. 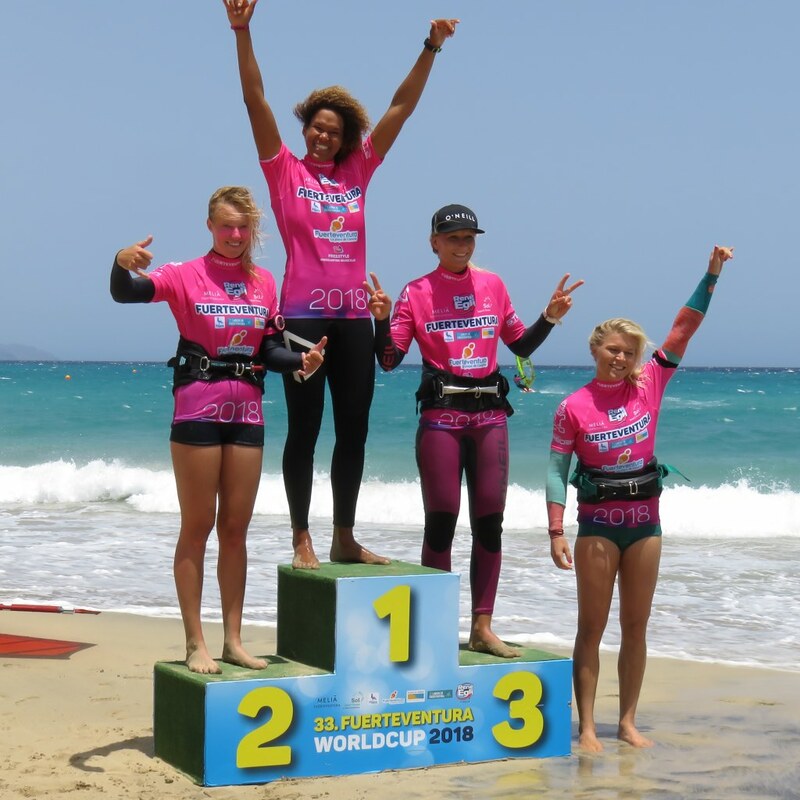 The event existed 30 years, and the government provided equal price money for men & women, which is a first time EVER in windsurfing history. A super good and hopefully inspiring gesture, and it paid off by having the biggest women fleet in many years for a wave event. I decided to go ten days prior to the event, so I could train a bit before the competition. Pozo is incredible windy, and I’m not used to the onshore conditions of this spot, especially as it’s port tack, my worse side for wave riding. Sadly enough I was suffering a bit from a bad crash on the water, where I hit my head hard (yeah, water can be hard sometimes ;-)). I had to take rest, but I was able to compete. During the event the wind was even stronger than the days before, and I was stacked on my smallest sail. The guys, 20 kg heavier, where on the same size sails, which says a lot about the wind…. I managed to finish in shared 5th in the single elimination, but dropped to a 9th place in the double elimination after I lost of my good friend and fellow freestyler Maaike Huvermann. The day after the event Maaike and I took the ferry boat to Fuerteventura, to swap our wave gear for the freestyle boards and sails and for the 2nd stop of the Freestyle World Tour. 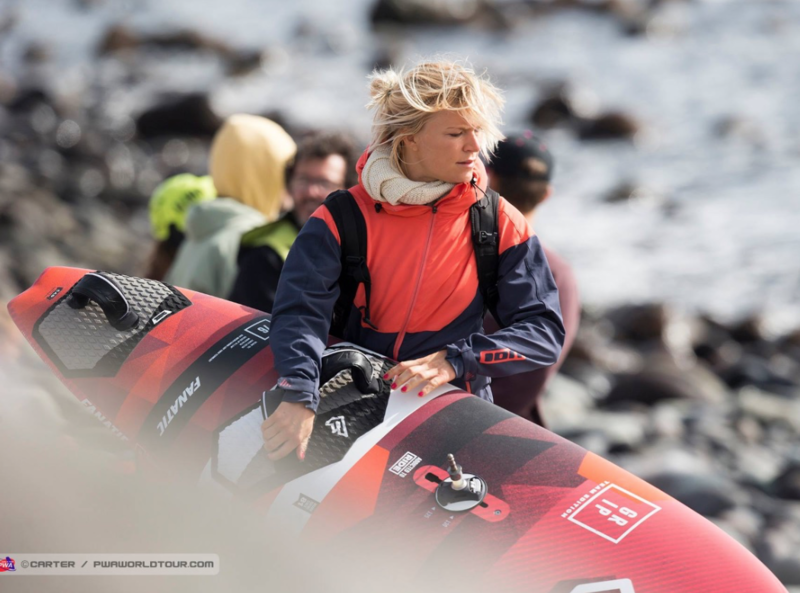 You might not expect it from a windsurfer, but I tend to get very seasick on boats (even on my windsurf board sometimes, to be very honest), so I don’t particularly enjoy those travels. The first 20 minutes on the freestyle gear feels very strange, after being with wave gear for a while. The straps are in a different position, so I always keep searching for the straps with my feet or hitting my toes! Fuerteventura is a very difficult freestyle spot. It’s mega windy, and it can be very gusty due to the offshore winds. This year however, the wind was a bit unusual. Normally we finish at least one or two double eliminations, but this year the wind was letting us down a bit. We managed to finish a single elimination, where I made it to fourth place. 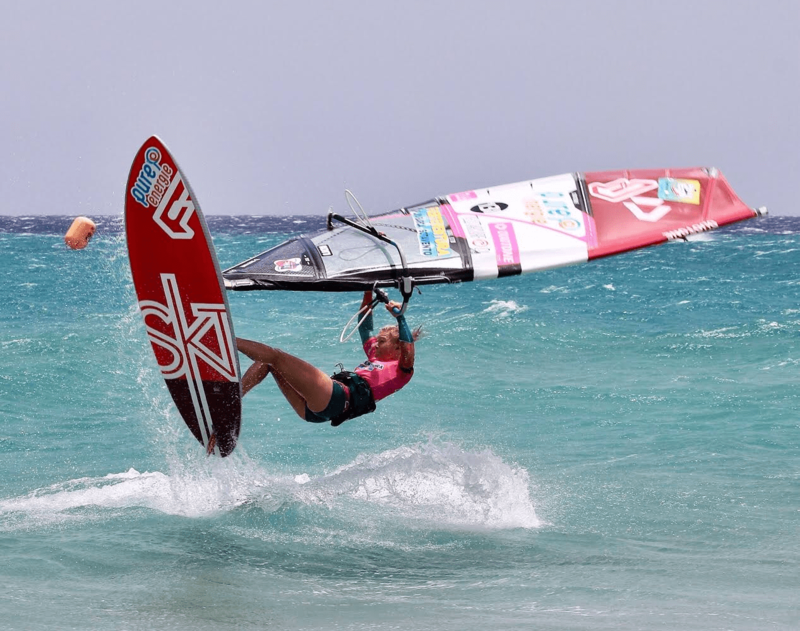 This gave me an overall result of 4th place in 2018, as it was the last women freestyle PWA stop of this year. 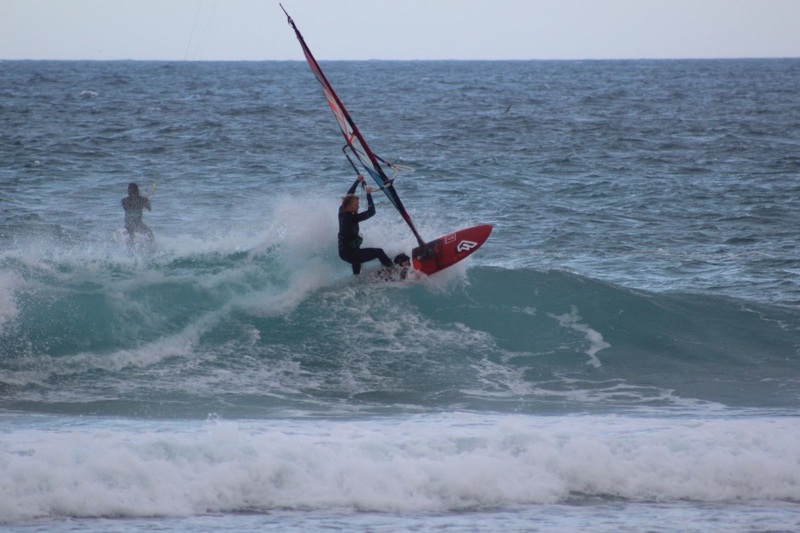 After the competition in Fuerteventura I had a few days of ‘holiday’. We traveled to the northern part of the island and scored a quite unexpected, but super nice wave session. It was so much fun, and it was nice to be able to test out my new Duotone sails bigger than a 3.0 size! After this epic day it was time to get back on the ferry… which took us to the last stop of the Canarian Islands; Tenerife. I like Tenerife a lot, I’m always happy to spend the last two weeks on this island. The village where we live is nice and cozy, there are many nice restaurants and it’s all walkable. Although we didn’t had any wind the days before the competition, the forecast looked promising. And it delivered! In Tenerife you need to have all your sails ready. It can change so much from one moment in the day to the other, the tides change the conditions a lot and the wind can drop any moment as well. I was prepared very well this year and always had three quivers rigged up. During the event I rigged up everything from 3.4 / 3.7 / 4.0 / 4.2 / 4.5 to 4.7, as it changed every day. My first heat was against Birgit Rieger. Just before our heat the wind dropped, and although I decided to take my bigger board in the last moment, it was still not enough to plane during the heat. 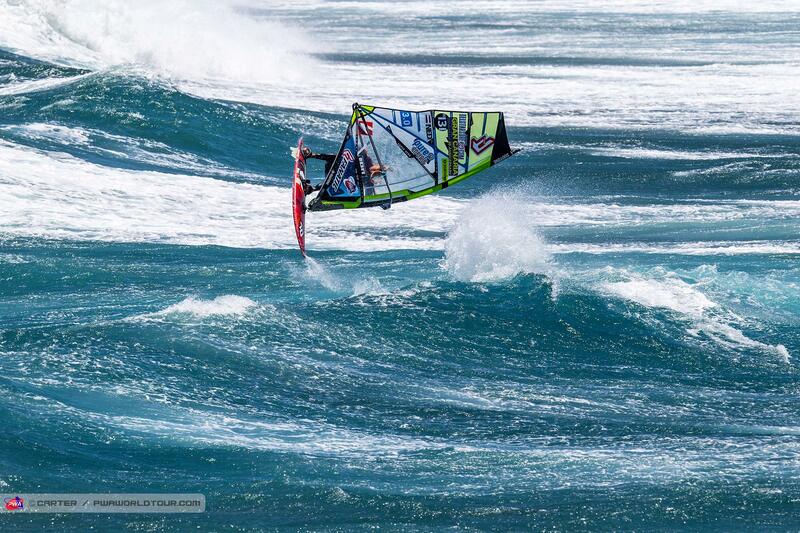 Luckily I got a good forward in at the beginning and managed to ride some waves, and I passed the heat by 0.5 points. I wasn’t very happy with my sailing, but I passed. Next heat I was up against last year’s World Champion Iballa Moreno, not an easy one to beat ;-). To my surprise afterwards I was leading the heat for almost 10 minutes, before she took over with some super high scoring wave rides. 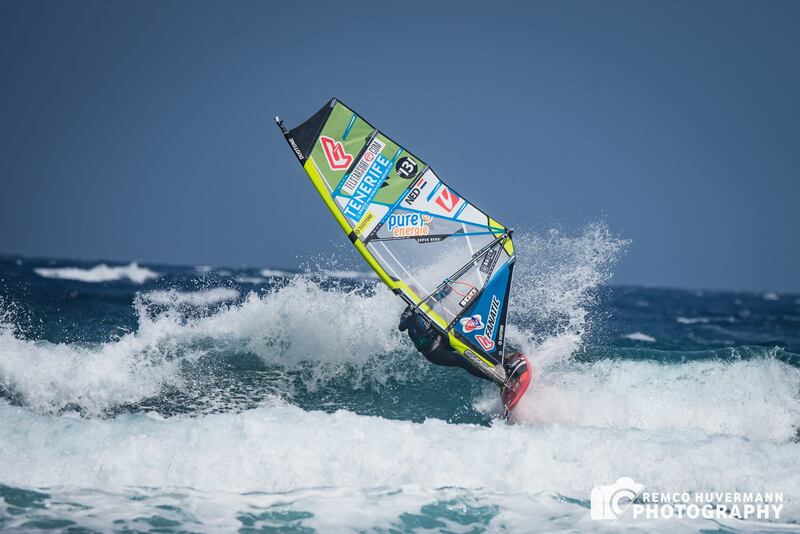 But I was very happy with my sailing; I managed to find all the big waves in my heat, had the highest scored jump of the heat and some nice wave rides. It’s funny, I felt so much better after that heat although I lost, than of my first heat although I won. It’s not all about winning in the end.. , but enjoying your sailing and feeling in good form on the water. In the double elimination I was up against my team mate Nicole Bandini, but I managed to win and next up I was against Lina Erpenstein. She is a very good wave sailor and I went in with no expectations, but in the end it was a very close heat with only 1.5 score difference. Finished 7th place, and I was very happy with this result. A good way to end the one and half Canarian Island Tour! Thanks to everyone for another great time on all the islands. The wave girls, the freestyle fleet, Maaike, Berk, the coffee girls, Cami, Alex and Alexa, all of you! Now I’m back home, and I must admit, it feels soooo good to be home! Already scored three wave sessions in one week, and today I went out for al little SUP session in the waves. At the moment I’m working hard on my new website, which is build by ConVident (www.convident.nl) a website builder who is very good at surfing online. It will be launched in two weeks, so stay tuned! In the mean time, sorry for the inconvenience on this website, as not all my clinics are up to date and online. You can always send me an email if you would like any more information about clinics and dates. http://www.arrianneaukes.com/wp-content/uploads/2018/08/Screen-Shot-2018-08-22-at-10.42.58.png 778 1050 Arrianne_423 http://www.arrianneaukes.com/wp-content/uploads/2018/09/logo-300x298.png Arrianne_4232018-08-23 09:27:512018-08-23 09:27:51Canarian Islands + New website!